We often forget about vision when considering monitor height. Robin Cyr tells us how important a factor it can be when attempting to lessen neck pain. The viewing angle when looking at one’s desktop monitor, laptop, tablets, and smartphones is an ergonomic risk factor receiving a great deal of deserved attention. Injuries related to neck pain and potential damage to the cervical spine and discs are well documented in users of all ages. Lately, the focus has been primarily on teaching avoidance of “looking down” and flexing the neck while doing so. This is an especially significant risk with constantly used, hand-held devices and to anyone of any age sustaining this awkward head-on-neck position for hours each day. There are, however, a host of associated risks with monitors that are too high to view with one’s head level that are not currently garnering as much attention. While use of small, portable gadgets is on the rise, many workers are still tethered all day to desktop systems… with or without sit/stand capability or monitor arms. Monitors are often too high as users’ vision needs change over time and their workstation set-ups do not, or there is simply lack of understanding what “viewing the screen with head level” means. Let’s take a look at those risk factors and how to recognize them through responses to computer-delivered risk assessments or in person in the field during ergonomic desk assessments. First, a brief review of human anatomy and physiology. The human head weighs around ten pounds. Visualize a 10 pound bowling ball perched on your shoulders and supported by your neck. When your head is level, your bowling ball weight-skull is virtually weightless on your shoulders and you have no physical sensation of the weight being carried. When you lean forward, your head automatically tilts back extending the neck and compressing the discs between the cervical vertebrae, resulting in tightening the muscles in the neck, upper shoulders and between or beneath the shoulder blades to bear its weight. Second, consider that most workers at or over the magic age of 40 begin to experience age-related farsightedness (presbyopia) and now need reading glasses, over-the-counter or prescription, to see clearly up close. Keep in mind that for human eyeballs, close focus involves the slight rotation inwards (convergence) at a downward angle to view something closer than about 36 inches. That’s why what when you sit down to read a book or newspaper, you automatically hold it well below “eye level” because this is the most comfortable position for your eyeballs to do their job of focusing on something close to you. Note, too, that gazing downward to read a book or magazine does not necessarily cause you to bow your head by flexing your neck. Workers are used to hearing that they must be able to view the monitor (digital screen equipment) with head level. However, the admonition to “view the screen with head level” usually doesn’t include the caveat “with head level while wearing whatever vision correction is required to see the screen in focus.” As a practicing ergonomist with 20 years of experience, I’m finding many monitors much too high for safe, ergonomic posture. I routinely have to remove monitor risers rather than add them to a workstation. What follows are the clues that worker vision is at the heart of neck extension and pain when seated at a too-high monitor. 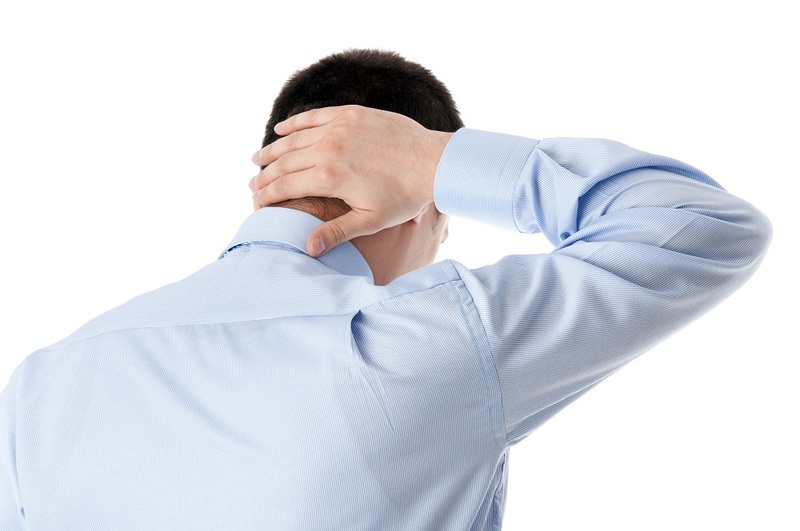 Upon visiting customers with newly reported neck pain, I noticed that the most common change in their work environment had been the addition of non-prescription, “over-the-counter-readers” to their repertoire of daily-used equipment or tools. Onset of neck pain may occur only days or weeks following adding glasses into their lives. What follows are three examples of what to look for. Customers, who have had success with these often fashionable “readers” assume that if they work for reading, they will work to see their now-fuzzy monitor screen. When given an opportunity to simply watch them work, most would grab their “readers” and pivot to face the monitor, tilt their head back (visualize a turtle seated upright at a computer monitor with head thrust forward) to see through their glasses, and begin to work. The problem of head tilt/neck extension is even more exaggerated when tiny, tip-of-the-nose or “half-readers” are the customer’s selected option to needing help with close vision. Why won’t “over-the-counter-readers” work at the computer? Because regardless of the magnification strength (+1.0, +2.0, +3.0, etc. ), the focal range to see clearly using them is only about 18 inches from the eyes. Because none of us sit that close to our monitors, leaning forward to about 18 inches is the only way to bring the screen into focus when wearing them. A similar problem exists for long-time prescription glasses wearers who now need extra help with close focus. The typical lens of choice is an unlined, multifocal range “progressive” lens. The sweet spot for mid-range viewing is in the middle portion of the lens just below pupil height, as it must so the wearer can see distances clearly with head level looking through the distance-focal range in the top half of the lenses. If the monitor has been set at eye level, as it was before they got their new glasses, they now have to tilt their head back to see through the “sweet spot” in that progressive lens. The last most common clue that vision is driving awkward head and neck posture at the monitor is seeing someone without glasses constantly leaning forward when working. Given that this is a posture that also reflects intense focus or concentration, have a conversation with your customer about causes. They are likely completely unaware of doing this. Denial of need for vision correction is common for assorted reasons ranging from not recognizing that vision has changed sufficiently to warrant a visit to one’s optical provider, to not feeling able to invest the time or money into having one’s eyes checked, to simply not wanting to acknowledge it is something that finally has to be addressed. Use this opportunity to engage your customer to help them become aware of a posture you see that you know will ultimately cause harm to them and to help guide them to a range of solutions. The quickest way I have discovered to demonstrate problems with monitor height for customers with or without glasses is to have them sit in whatever their preferred posture may be when viewing the monitor. Next, ask that they simply focus on your finger as you point to different areas on the monitor face. Point to the bottom of the screen where it is likely the toolbar resides. Point somewhere near the middle, to one side or the other. Finally, point to the top of the monitor. As soon as you see their head bobble and chin tilt up, you have the evidence provided by their own body that the screen top is too high. Repeat, if needed, so your customer can feel the shift in head position. I never try to “eyeball” monitor height based on my observation of a customer in profile seated at their monitor. My only criterion is evaluating their head position when asked to focus their eyes on something at the top of the screen. Remember from the discussion above that for human eyes to work properly for close focus, they must rotate slightly down and in? That automatic head adjustment is the signal their body is sending that the eyes are compensating for the need to gaze down at something that is too high by tipping the head back. Once your customer understands that when they are not thinking about head position the body will readjust in whatever way it must for the eyes to focus on the screen, persuading them to allow you to change the height is easier. Ultimately, the monitor will be the correct height when tilting the head back is no longer required for the eyes to view the top of the screen clearly. If viewing the monitor requires head tilt all day, every day when seated at the computer, neck pain and physical alteration in the muscles and discs over time will be the result. Most of my customers “get it” right away and report immediate relief to neck discomfort when we lower the monitor. For those customers that protest the change is “uncomfortable,” try suggesting that perhaps they mean “unfamiliar” rather than physically “uncomfortable or painful.” Ask if they will give the new monitor position a try for a week to 10 days to allow their muscles to readjust and for this change to become “comfortably-familiar.” Finally, be sure to follow up by phone or in person to see if the change has relieved their symptoms. If this has got you thinking about the specialist help you might need with your ergonomics programme, then contact us today. This article, written by our own ergonomics specialist Robin Cyr, is featured in the Fall/Winter 2016 edition of Cardinus Connect, the magazine for ergonomics professionals. Download your free copy here.